Light levels inside the greenhouse are determined by the covering and the amount of condensed water on the film (blocking and reflecting light). Heat-saver greenhouse poly starts with excellent light transmission and has an anti-condensation feature ensuring optimal light conditions. 5 mil, 24' wide for greenhouse light deprivation. Attach poly to pipes or tubes 25 mm (1") outside diameter. Use with 3/4" electrical conduit or water pipe. 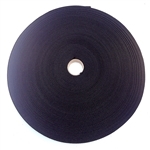 Ideal for applying tension to poly, the width minimizes abrasion. Very durable.